Vacation Rentals & Holiday Rentals in France : House Bonaguil. 1000gites.com vous propose des rentals de vacances Bonaguil avec photos, disponibilités et descriptifs détaillés. House in a property in countryside with 10 bedrooms, dining room, living room, open-plan kitchen, 3 bathrooms, 4 shower rooms, 8 WC. Number of beds: simple bed (9), double bed (2), king-size bed (6), sofa bed (1), cot (2). 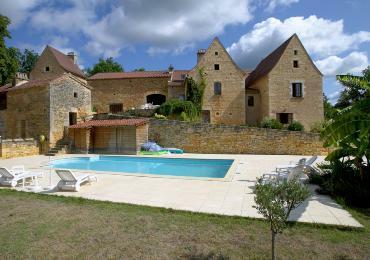 Secluded 17th century stone hamlet restored with pool, paddling pool and sauna. Ideal place to bring your family or friends together. The hamlet could comfortably accomodate up to 20-22 people. 1km from the castel of Bonaguil Altitude 200m.